Lots of web designing companies can provide cool web designs and website design services - but for a high price, often charging much. There are also many companies that offer cheap web design - but the quality of the design is usually poor. for our website designers. 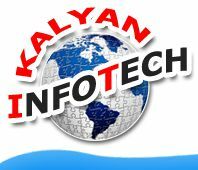 With Kalyan Infotech you will experience an exceptional level of personal service and flexibility. We have all the professional web page design skills, but as a small website business ourselves, we keep our web design prices extremely competitive providing friendly and professional web design services. Already have a website and just want to maintain it your own whatever it may be, like updating news section, members, content management, photo gallery, message board...just name anything. Basic idea is to converting a simple site (with database) in a more lucrative and easy way to update online yourself. Change categories, sub-categories and products or Sellers/Buyers and many more features so that you maintain your Website/Portal online your self.